Punjab Chief Minister Amarinder Singh today strongly pleaded the Punjab’s case for acceleration of pace of modernisation of the police and sought a 100 per cent grant-in-aid from the Union Ministry of Home Affairs. The government has failed, to take up the task of providing education to girls in one of the most backward ‘Bet’ areas of the district but a non-government organisation has taken up this task. 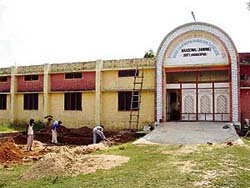 Swami Chetna Nand Maharaj Bhuriwale girls college in remote Mansowal village of Hoshiarpur has been providing education to 150 girls. Mr Gurtej Singh, SDM, Sangrur, has started proceedings of the magisterial inquiry ordered by the Sangrur Deputy Commissioner into the alleged custodial death of a 20-year-old Dalit boy, Ballu Singh, son of Mr Mithu Singh, a resident of Chathe Sekhwan village, near here. Ballu Singh had allegedly died in police custody about a week ago. Giani Joginder Singh Vedanti, Jathedar of Akal Takht, yesterday courted yet another controversy when he honoured USA-based Dr Ganga Singh Dhillon , a Khalistani ideologue and president, Nankana Sahib Sikh Foundation, at a Gurdwara in Switzerland . The “Sikh Vision 2025”, a 612-page book authored by Hirsimran Singh and released by Giani Joginder Singh Vedanti, Jathedar, Akal Takht, has raised many questions with regard to the Sikh clergy. Known for using lathis on peaceful demonstrators, policemen in Punjab now intend to wield the pen also. Beginning next month, an illustrated magazine in Punjabi is what the Police Department intends to bring out every month. Lieut-Gen M.A. Jaki (retd), Col Vikramjit Singh, Hony Capt Vishal Jadav, Hony Capt Ganpat Suryavanshi and some JCOs, who had participated in the 1965 Indo-Pak war, on Saturday visited the town to pay homage to Major Surinder Prasad of 19 Maratha Light Infantry, Kolhapur, who had attained martyrdom while leading Delta Coy. to recapture the Thathi Jaimal Singh post in the Khemkaran sector. The Improvement Trust today handed over allotment letters of 16 shops in the Nehru Shopping complex in the Lawrence Road area to Mr R.R. Desh, Chief Passport Officer, for setting up the much-awaited passport office here. A state-level conference of the Indian Academy of Paediatrics and Intensive Care Chapter, Punjab, organised jointly by the Paediatric Forum and a branch of the Indian Medical Association, Hoshiarpur, was inaugurated by Dr Harbans Lal, an ex-Professor and Head, Department of Paediatrics, Medical College, Patiala, here today in which more than 230 child specialists from all over the state participated. Standing crop in more than 42,114 acres has been damaged in 62 villages of this district due to hailstorm two days back. Hundreds of farmers, whose standing crops were lashed by the hailstorm, have demanded a compensation from the state government. 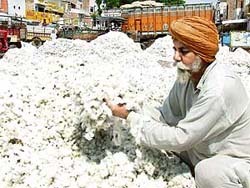 While the Punjab Chief Minister, Capt Amarinder Singh, yesterday instructed the Financial Commissioner (Revenue) to order a special girdawri to assess the damage to crops due to rain and hailstorms in various parts of the state yesterday, the Agriculture Department has directed its officials to be in touch with farmers to assist them in handling the flattened paddy crops at this stage. Dr Gurdev Singh Khush, an eminent agriculture scientist and renowned rice breeder, here today called upon farmers to use the underground water with restrain to save the state from becoming another Rajasthan. A bumper cotton crop is expected this year and farmers coming to sell their produce in the biggest cotton mandi in Asia here are elated. Because of high temperatures throughout July and August this year, the arrival of first harvest of the crop is gaining momentum here. A middle-aged woman of a poor family allegedly committed suicide with her three children by jumping into a canal near Muktsar. Two policemen have been booked for allegedly killing a cattle thief after a long chase at Gayana village on the intervening night of September 20-21. ASI Surjeet Singh has been arrested, while head constable Lakhbeer Singh is still at large. Three persons were killed while three others sustained serious injuries when the truck in which they travelling hit a tree near Dher village in Anandpur Sahib last night. The three killed on the spot were identified as Balram Singh, Harminder Singh and Amrik Singh, the driver. Ms Arwinder Kaur of Mugowal village in Hoshiarpur district has alleged that she was maltreated and tortured by her NRI husband and other members of her in-laws family. The district police here has solved the kidnapping case of Kamlesh Singh, son of Mohinder Singh, of Basoa village. 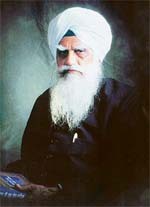 Kamlesh was kidnapped on September 8 by Panjab Singh, son of Kirpal Singh, of Jaloke, under Mamdot police station of Ferozepore district and his accomplices. Students of the Om Parkash Bansal Modern School, Mandi Gobindgarh, held an exhibition on the confluence of science, modernity and art at the school yesterday. The Unemployment B.Ed Teachers’ Front, Punjab, held an emergency meeting in Sector 17 here today. The teachers have been on a relay fast for the past 20 days in front of the DPI (Secondary) office. They are demanding that they be provided regular jobs. The State Bank of Patiala has asked all its branch heads in Punjab to step up lending to rice sheller units in the state. Mr C S Jagdish, Deputy General Manager, State Bank of Patiala, who is personally monitoring all loan cases on a daily basis, said that the bank was organising special camps at various towns in Punjab. He assured all rice millers that their loan cases would be processed and sanctioned on a priority basis, and all bank managers had been advised accordingly.